Texas police chiefs are urging Gov. Greg Abbott to veto legislation repealing certain handgun restrictions in Texas if lawmakers do not remove a controversial provision the chiefs fear would allow criminals to carry firearms without repercussions. 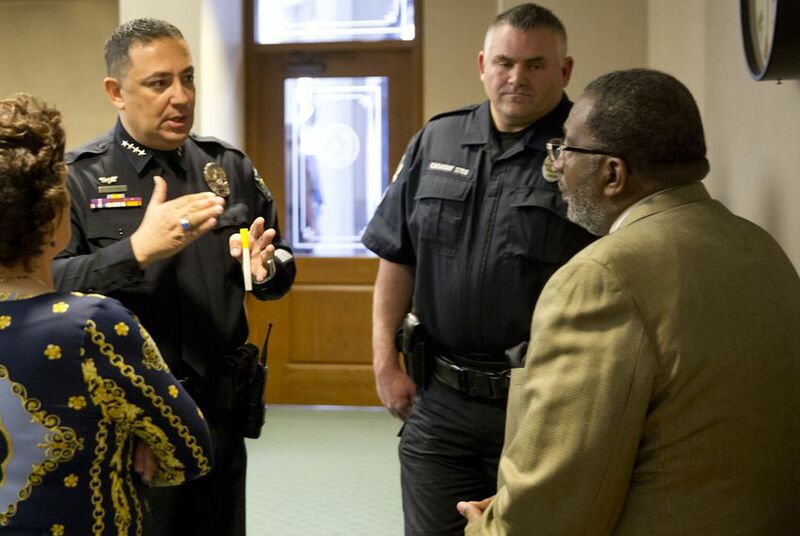 If the provision stays on the bill, the only responsible thing for Abbott to do would be to veto it, Austin Police Chief Art Acevedo said at an impromptu news conference organized as the legislation faces what could be a final vote in the House on Wednesday. "You can't be the party of law and order and not listen to your police chiefs," he said. At issue is language added to House Bill 910, the bill allowing licensed Texans to openly carry handguns, that limits the power of law enforcement to ask those visibly carrying to present their permits. Opponents say that provision amounts to a backdoor effort to repeal licensing requirements for handgun-toting Texans altogether. The provision has support from some Democrats who say it would help prevent racial profiling, as well as conservatives who say it is necessary to protect Fourth Amendment rights against unreasonable searches and seizures. Flanked by about a dozen law enforcement leaders from around the state, Acevedo said Wednesday that the legislation would "handcuff" police officers, endangering both them and the communities they protect. "It absolutely allows criminals to carry a gun with impunity," he said. Stripping the language from the measure at this stage in the legislative process would have to happen in conference committee, meaning House lawmakers would have to refuse to concur with Senate amendments to the bill. As of Wednesday afternoon, that appeared unlikely to happen. The bill's author, state Rep. Larry Phillips, R-Sherman, told The Texas Tribune that he intended to ask the House to vote to accept the Senate's version of the legislation. While Phillips said he respected the concerns of law enforcement, he added that he believed the language in the bill only reiterated the law as it currently stands. Abbott, a Republican, has yet to weigh in on the particular provision — though he has said he will sign whatever open carry bill reaches his desk, including so-called "constitutional" or unlicensed open carry.